The Hostel Restaurant El Garrotal is your reference point in Palma del Rio to enjoy and to do business in the whole Region of the Vega of the Guadalquivir. Visit a zone in full tourist and economic development from a position favoured to half a way between Córdoba and Sevilla. Taste in the restaurant our selection of wines and typical seasonable plates of the region or the daily menu. After a day of leisure or work, rest in our comfortable rooms with all the facilities. 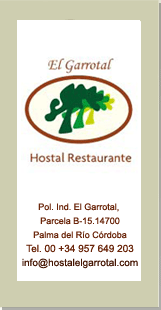 The Hostel Restaurant El Garrotal offers the best quality by an incomparable price and the major attention to clients and companies needs .